Redecorating your bathroom might require many new accessories such as new toilet roll holders, mirrors, or a new toilet brush holder. All these accents will help you complete the process and create that ambiance you have in mind. If you’ve reached the toilet seat search stage, you might want to make things easier by checking the products showcased below. The toilet seats we’ve found come in various styles and colors and at different prices to suit all budgets. One’s home is an expression of one’s personality and idea of beauty and style. Given all that, you might want to check this product when decorating your bathroom. This toilet seat from Sanilo can make the difference you’re interested in. The durability of the product is ensured by the molded wood used and its strong hinges. The seat fits all manufacturers’ round bowls and its length is adjustable from 15.3 to 17.1 inches. This item is not only easy to install and clean but it also comes in a great variety of designs so you can choose the one that matches your bathroom or preferences better. If comfort and style are the things you look for when it comes to the toilet seat you use, this model from Mayfair might be just what you need. Its durability is ensured by the molded wood core whereas comfort is provided by the soft cushioned vinyl seat cover. The butterfly embroidered design will complement your bathroom décor and give it a unique touch. Moreover, the product is easy to clean thanks to the removable hinge. You can thus remove the seat with ease in order to clean it. Plus, the product fits all manufacturers’ round bowls. This model from TOPSEAT debunks all myths that toilet seats are dull. If you want a touch of color or nature as well as comfort when it comes to your toilet seat, you might want to check this out. You won’t just enjoy comfort and durability thanks to the smooth hand sanded wood and the sturdy chromed metal hinges used but you will also get to feast your eyes on the 3D high definition tree image that changes in each of the four seasons. The luxury feel is further ensured by the superior quality glossy white paint finish. If you want more than comfort when getting a new toilet seat and you’re interested in spicing up your bathroom a bit with some colorful design, this product from Sanilo is an option you might want to consider. 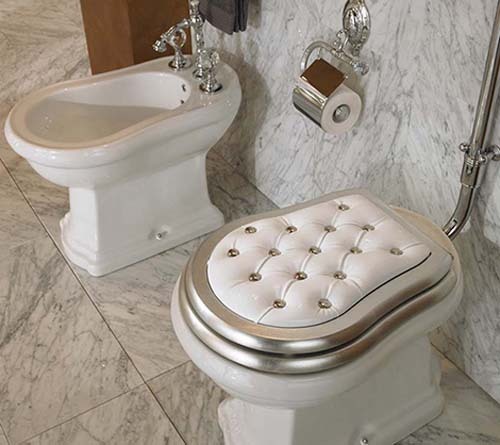 This toilet seat fits all manufacturers’ elongated bowls and its length is adjustable from 16.9 to 18.7 inches. No need to worry about its durability as the product features molded wood and strong hinges. It is both easy to clean and install and the rich variety of designs it is available in will allow you to match it with all sorts of bathroom styles. With this leather and oak toilet seat, be sure your bathroom upgrade won’t go unnoticed. This luxury toilet seat from SIGNATURE COWBOY STUDIO uses only handcrafted materials and can be customized according to your preferences. You have the possibility to choose the tooled leather used on the top of it as well as the color of the hair on the cowhide. The cast iron horse heads are hand painted and the quality of the leather and wood used make the product ideal for long-term usage. If you want your place to reflect your Western personality, then this model is worth considering. Want to transform your home for Christmas? Create that décor you will love and remember by adding this 3D nose toilet seat cover to your bathroom. It won’t just trigger smiles but it will also add to your comfort. This festive toilet cover uses polyester and plush and the package includes a rug and a tank cover. All of them will add to your comfort and, of course, to the festive merry mood. The rug features an anti-slip back and all the three pieces included in the package are easy to install. If you want a product that can match a futuristic-looking toilet roll holder, we suggest that you check this unit out. The product is easy to install as you just have to place it over your existing toilet. Therefore, to do so, you won’t need to use special tools or assistance. On top of that, the model comes supplied with a stainless-steel self-cleaning nozzle, a warm air dryer function, a warm water wash option, and many other features. Furthermore, this item can be controlled using a remote. Overall, this product is well liked by previous buyers because it is easy to use and very intuitive. Another model that might also catch your attention is this item developed by Bio Bidet Slim ONE. The device was constructed using what the manufacturer calls water tank heating technology. Consequently, the duration of the warm water supply that you will be provided with will be increased. Besides, the model features a self-cleaning nozzle that has been constructed from stainless steel as well as an in-bowl light so that you can see the bowl while using it during the night. This heated seat can be adjusted so that it best fits your needs and it measures 20.8 inches in length, 18.6 inches in width, and it is 7.5 inches in height. If you want to acquire a toilet seat that can match a cool-looking toilet brush holder, we recommend that you check out the Bemis 500EC062. This model comes supplied with twist hinges that you could utilize to remove the seat for effortless cleaning or replacement. Furthermore, the device was built from molded wood, a material that is highly durable and that has a glossy finish that makes it resistant to scratching and chipping. To clean this model, one has to use a wet cloth and a mild detergent. This way, you can avoid damaging the unit. If you are trying to find a product that is effortless to clean and easy to remove whenever you want to replace it, we recommend that you don’t overlook this product sold by Mayfair. This model stands out because it comes equipped with the STA-TITE seat fastening system, a system that guarantees that this device won’t get loose as time goes by. Besides, the model is said to fit most round toilet bowls that have been manufactured in the U.S. as well as in Canada. The item was made from wood, and it has a finish that prevents it from being easily scratched or chopped. Another item that should not be disregarded is the Bemis 1500EC068. This product has received many positive reviews, and it is highly appreciated because it is easy to clean and change. The device is made from high-quality wood, and it is covered in a protective finish. The manufacturer recommends that, when cleaning this model, one only uses mild detergent and a cloth. In fact, by washing the product with a brush or with other similar abrasive cleaners, one risks damaging it. Although a majority of buyers were happy with their investment, some purchasers were not content with the color of the product that they received. When it comes to revamping one’s home, one of the most difficult jobs has to be finding the necessary furniture pieces so that you end up with a cool-looking bathroom. And, while picking toilet brushes or bathroom cupboards might not be such a dreadful task, a closer look at this drudgery enables you to understand that, the main element that seems to be particularly difficult to select is the toilet seat. The reason why this is an issue is the fact that, when it comes to toilet seats, we are dealing with having to make a series of difficult choices. In other words, while still taking into account aspects such as style and comfort, one has to also pay attention to features such as type, shape, material and extra features. As a result, before choosing such a product, one has to spend a lot of time reading best toilet seats reviews, for sale, a job not many would wish upon their worst enemy. Does this whole situation seem familiar? If so, we are here to lend you a helping hand. Because we know just how difficult this process can be, we took it upon ourselves to do the legwork for you. Consequently, below you can find a list of must-have features that should be considered before the placement of any order. What is more, our selection of features has been based on aspects such as users’ feedback, reliability and overall design of the products. So, don’t waste anymore time; keep on reading and select accordingly. Before anything, one of the first decisions any shopper for cool toilet seats has to make is related to the type of seat they want to choose. From this point of view, the options one has are pretty wide. For example, you can choose between hard and soft toilet seats. While the first type is more common and can be easily purchased in many designs, the second type is ideal for those interested in a product that is able to provide comfort. However, the main disadvantage of soft models is the fact that, in time, they are likely to develop cracks and ultimately become unsanitary. Likewise, when shopping in this category of products, you can also choose between elongated and round shapes models. What is more, sales figures have shown that people started being interested in buying bidet toilet seats. Therefore, if you want to take a step forward and give up the old fashion models for a more modern alternative, this could be something worth taking into consideration. Another factor you should consider before placing that order is the material that the seat is made from. The go to materials you should consider are plastic, wood, and polystyrene. While plastic toilet seats are cheaper and more common, our advice to you is that you spend some time and assess the other options. Thus, wood seats are usually more sleek and stylish, adding a plus of elegance to your bathroom. 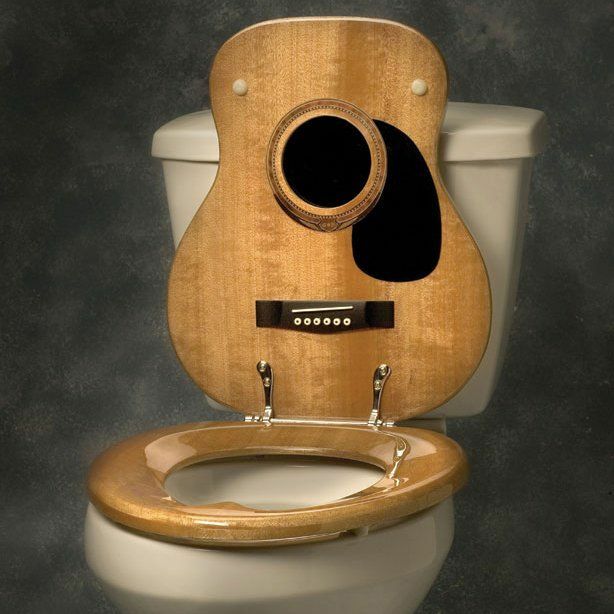 Moreover, wood made toilet seats are said to be durable and corrosion free. Similarly, models made from polystyrene are considered quite reliable. Still, no matter what type of seat you end up purchasing, it would work best if you checked the online reviews and buyers’ comments for additional information on the product. By doing so, you’ll be able to see whether or not there are undisclosed issues with the chosen product. Another key aspect one should not overlook is the design of the toilet seat. When purchasing a new item, it is best to think about the fact that your new acquisition should fit nicely with the overall layout of your bathroom. Therefore, if you are trying to go for a cool, fun look for your bathroom, it would be a good idea to search the web for funny toilet seats. The great advantage of these models is the fact that they bring a pop of foolery and creativity in a room usually quite dull. Some of the most appreciated models you can get online are those that display funny faces, cartoons or jokes. By settling for any of these models, you will be able to ensure that most intimate of moments transform into fun ones. Besides, more and more current users seem to be fascinated by the floral models. These particular designs are prone to make your bathroom more fancy and colorful. In no time, you’ll discover the joys of purchasing additional items and decoration articles in order to complete the room’s design. Furthermore, not only a place of storing toilet paper, your bathroom can become a place where comfort meets technology. The way to achieve this is by settling for a toilet seat that was designed to make use of up to the minute features. For instance, you can now opt for a deodorizing toilet seat. Constructed so that it includes a carbon filter, this type of product are capable of neutralizing bathroom odors. Therefore, by choosing this type of models, you won’t have to keep investing in bathroom air fresheners. Also, another great idea would be for you to settle for a lighted toilet seat. The main advantage of this model is the fact that the nightlight unit that is able to guide you in the dark while still not irritating your sleepy eyes. In addition to this, it might be advisable for you to check out heated toilet seats as well, as they are capable of providing extra comfort. Anyhow, always keep your eyes on the information about the product’s quality and installment process, especially for the modern models. Moreover, products that have adjustable hinges should be preferred. The reason for this lies in the fact that they permit you to flawlessly fit the seat on the pan.